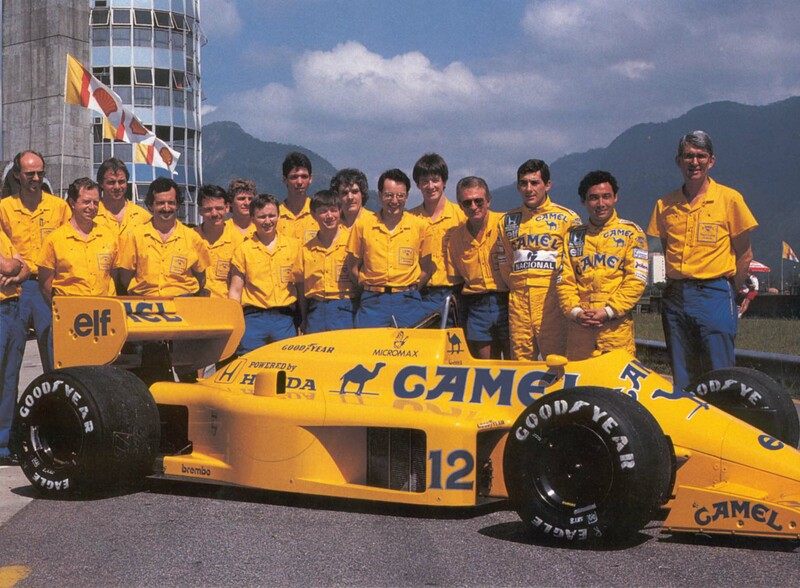 The years 1987 to 1989 were pivotal ones in Team Lotus’s history in Formula One with a triple World Champion Brazilian arriving to the stable while a future triple World Champion Brazilian was leaving it. The last hurrah - told by their contracts. 1987 marked the first of two transitional years in Formula One. Following the turbo-exclusive year of 1986, the FIA started opening up regulations to lead the continental circus into the normally aspirated age. For the first time, a mandatory pop-off valve was implemented on the turbos to restrict power and Cosworths were making a comeback. Honda, who already mastered the use of the turbocharged engines, slowly shifted from being an exclusive engine supplier to Williams of earlier years to providing engines - during the transition - first to Williams and Lotus in 1987, then Lotus and McLaren in 1988, only to become a McLaren-exclusive partner in the normally aspirated era - leaving the British team in the gutter after they left them in 1992. Lotus - beginning with 1987 - was thus powered by the most successful engines of the final years of the turbo era and they also scored a brand new title sponsor. Their long-standing relationship with Imperial Tobacco came to an end, who have been supporting the legendary British team through their Golden Leaf and John Player Special brands since 1968 (except for 1979 and 1980). 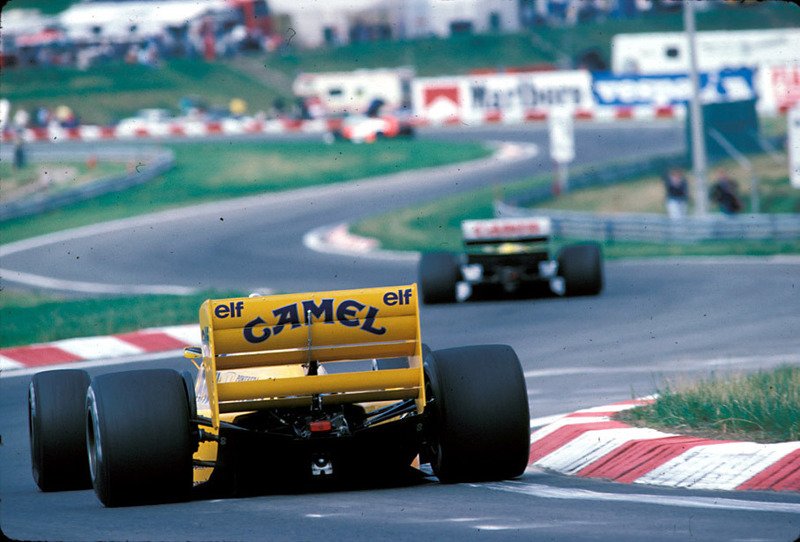 A new tobacco firm, R. J. Reynolds was entering into agreement with Lotus through the Camel brand on the cars in exchange for some stellar money given to the team, thus Camel Team Lotus Honda was born. There were some conditions, though. At the beginning of 1987, R. J. Reynolds wished to bring in double World Champion Nelson Piquet while also retaining rising star and proven race winner Ayrton Senna. Piquet - of course - stuck to Williams and was only optioned for Lotus by the tobacco firm. All parties entered into a quad-lateral agreement individually - revolving negotiations between the sponsor, the team and the two drivers - and the four different contracts came down to a chart of payments from R. J. Reynolds, beginning with 1987. Senna then receives $2,500,000 from R. J. Reynolds in three parts over the season. However, his contract with the team and the sponsor specifies something different as well. Senna was optioned by Lotus and R.J. Reynolds for the 1988 season as well, which we all know didn’t happen due to him leaving for McLaren at the end of 1987, which was made available by the following clause in the contract. It is somewhat ironic that he was able to enter into negotiations in early August, before he was paid by the whole sum of his salary (as seen in the table above). Nelson Piquet, the then-double world champion (triple by the end of 1987) was brought in for 1988 under the following monetary agreements. There are some very interesting figures here. First of all the fact, that Piquet was paid more than the whole team. The contracts, however, specify something more interesting as well. $500,000 was paid by R. J. Reynolds as a bonus if Piquet won the 1987 championship (which he did, with Williams). That figure is paid as $150,000 to Lotus and $350,000 to Piquet. (See footnotes #3 on the table). If he had won the 1988 title as well (which he didn’t) he and Lotus would have paid another $250,000-$250,000 with $175,000 paid immediately (see footnotes #5). For 1989, they payments looked as such. Nothing too interesting on Piquet’s side except the $220,000 paid at the end of 1988 if he didn’t enter into agreement with personal sponsors (which he did) and $125,000 paid at the end of 1989 if he won the championship (which he didn’t), thus his overall salary from R. J. Reynolds came down to $4,000,000 in total. The sum paid for Lotus, however, is utmost intriguing as a working copy of their contract tells. This is the agreement that was ultimately signed between them. And this is an earlier draft of the contract in said matter. $7,500,000 for 1989 is completely left out in the final version and no hard figures are specified later, other than the $3,500,000 mentioned in the chart above. $7,500,000 would have been a huge increase from $4,000,000 in the previous year, possibly explained by the elevated costs of the new engines. The draft puts this for 1990 (probably due to a mistake). As Honda ceased to supply Lotus at the end of 1988, it is up to anyone’s guess what background deal was made with Judd or whoever they were negotiating with at the time that the payment came down to $3,500,000 ultimately. While Piquest stayed until the end of 1989, both Honda and the late Gérard Ducarouge left at the end of 1988 to partner with McLaren and Lola-Ligier respectively. Specifically, the parts where R. J. Reynolds has the right to choose the solid background colour for secondary sponsors and the complete section of livery-approval are missing from the final contract. Both Senna and Piquet’s contract mostly deal with the same matters. The agreements spend an awful lot of space detailing the circumvention of sponsorship conflicts. Both agreements state that while on track, they are working exclusively for Lotus and his sponsors, sporting said colours. A small space on the sides and the chin of the helmet are restricted to personal sponsors as well a designated area for four sponsors on the front of the overall and for one on the back. The caps they were ought to wear - always the ones the sponsors designate, except on the podium, where they were contracted to wear GoodYear ones. Believe it or not, Senna had his very own contract for caps. And in case you didn’t know, he was an ambassador to Ford in Brazil (apart from being an Audi dealer later). Finally, both the drivers’ and Lotus’s contract with R. J. Reynolds specified Satoru Nakajima being the #2 driver in the team. Whoah, cue the Prost clashes in 1989, right away. 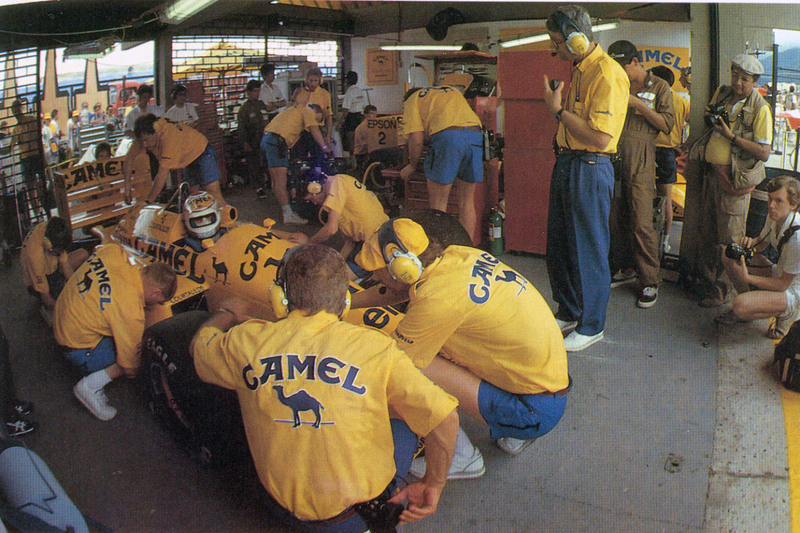 R. J. Reynolds went on to sponsor Team Lotus until the end of 1990 under the Camel brand. The team fell into a quick decline following the termination of the contract and went out of business at the end of 1994. This marked the only time R. J. Reynolds was sponsoring an F1 team [EDIT: as a title sponsor], however they had a successful campaign in the US in NASCAR, sportscar and drag racing through the Winston and Camel brands. 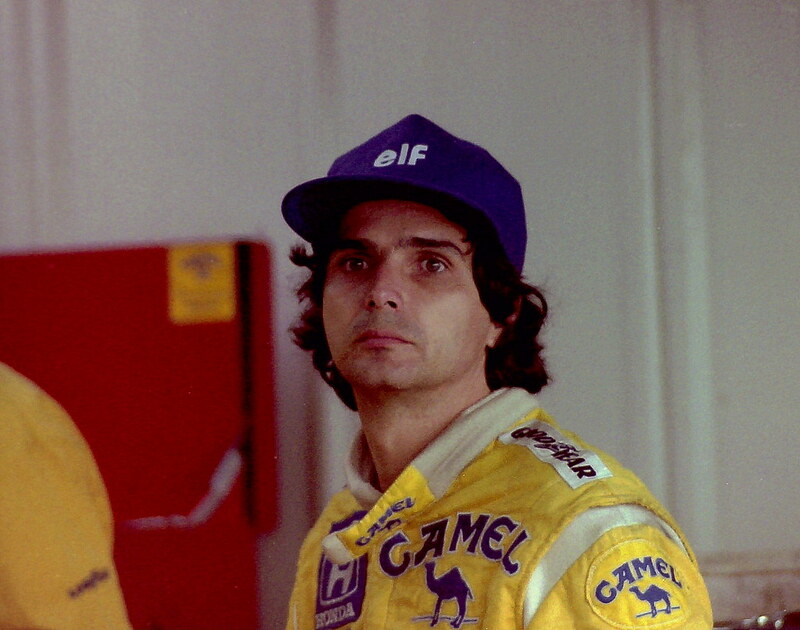 Nelson Piquet moved from Lotus at the end of 1989 and never won a world championship again. Ayrton Senna went to McLaren and won three world titles. Satoru Nakajima also left Lotus at the end of 1989. The all-British line-up of Martin Donnelly Johnny Herbert and Derek Warwick were the last drivers in 1990 to race with full Camel branding in Formula 1.